Windows are an important element of any room. They create flow, guide your furniture arrangement, and allow for the natural light and air you need to keep your space happy and healthy. But, we often overlook how window dressing is so much more than, well, window dressing, when it comes to tying a room together. If your curtains are dingy, ill-fitting, or just plain boring, it's time to give them a makeover. Upgrading curtains turns the natural light in a living space or bedroom into a focal point, adding that needed touch of character and interest. The best part is that giving your curtains a touch of pizzazz doesn't have to be difficult. 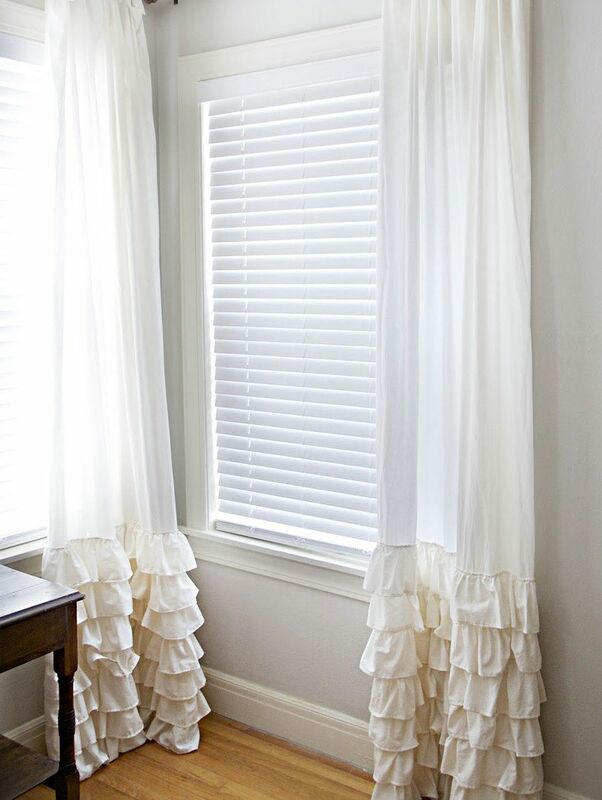 Like these DIY ruffled curtains from Masion de Pax, there a number of great curtain ideas that to draw from that don't require spending too much money or time. Shibori dyeing is an ancient Japanese technique that involves twisting or bunching fabric and using indigo dye to give it a rich, blue color. It's the perfect opportunity to upgrade your plain white curtains. These easy DIY curtains from The White Buffalo Styling Co look great in a bedroom or home office, and lend a sense of airiness and flow to the space. Since indigo can be a messy dye to use at home, recreate the look with the fabric-safe dye of your choice. If you're into the industrial chic look, this updated curtain rod is for you. Blogger Dimples and Tangles swapped a boring curtain rod for a galvanized pipe found at any hardware store. Match with neutral curtains to add a bit of edge to your space. Upgrade your curtains by getting rid of them altogether. We love the idea of ditching a kitchen curtain for a hanging herb garden like this one from The Bird and Her Song. Plus, who doesn't love a curtain you can eat? Pick herbs that are easy to grow inside and you'll never miss that café curtain again. This curtain rod upgrade is so easy. Give the windows in your living space a stately, traditional feel by using a brass curtain rod instead of a metal or plastic one. DIY this look with a bit of spray paint and a ping pong ball and instructions from Shine Your Light. Upgrading curtains doesn't mean have to tossing out the current ones. These adorable pom pom curtains from Bless'er House are incredibly easy to DIY, even for those who have no sewing experience. Be brave and mix bright colored pom poms with soft, neutral fabrics like linen or cotton to keep this look happy and breezy. Layering two or more types is a great way to add dimension and allow more control over light and air when changing a window with only a single treatment. Start with blinds or shades (this is a great, neutral bamboo look from Studio McGee), and install drapes four to six inches above the window to create the illusion of a taller ceiling. Curtain pulls can be stylish without looking matronly. This stunning geode tie back from A Kailo Chic Life can transform dull white curtains without springing for a new set. Customize this look with a rock or agate that speaks to you. For a fancier look, try a crystal doorknob. A tie back is especially useful in a room with blackout curtains that can feel too dark during the day. Curtains aren't just for covering windows—they're also great for separating areas between rooms or segmenting a studio space. Remember those beaded curtains from back in the day? Here is an updated idea from Design Love Fest! Take styrofoam balls and some simple rope to emulate the hippie curtains of the '70s, but with a modern flair. For those who feel daring, ditch the door, and use an opened beaded curtain to make your space feel larger. If parting with your curtains sounds too awful, this Restoration Hardware-inspired curtain rod is a great choice. Here, Maison de Pax uses stained wooden dowels and brackets easily found at a hardware store to give this living space a high-end feel for less than $20. Still have that potato stamp from your preschool days? Not Just a Housewife uses cheap IKEA curtains as the canvas for a whimsical triangle stamp pattern. Bubble wrap, cardboard, and other vegetables are also great stand-ins for a stamp. Macramé is a throwback that comes in and out of the spotlight that can easily be incorporated into your home. A stunning woven piece from A Beautiful Mess looks difficult, but even a novice knotter can replicate the look. This also works to segment off a kids' toy area, an alcove, or office, and can also be used in place of a closet door. Not an artist? No worries. This trendy striped curtain from City Cottage Chic just takes some measuring and a little bit of fabric paint to transform your old curtains. This look is subtle enough for any space. Try adding stripes to the master bedroom, a nautical-themed guest room, or a home office. Antlers are popping up in many home tours and for good reason. They lend a rustic, ski lodge-inspired feel to your home without overpowering the decor. Recreate these antler tiebacks from Stephanie Tackett with faux antlers found at any craft store and metal brackets from a hardware store. These floral curtains from Design Love Fest just scream "be happy!" Easy to recreate in just an afternoon, this bold look adds energy to your space and makes you want to smile. Pick any color palette, grab faux flowers from a craft store, and get gluing. Curtains are an easy project you can pick up in a weekend, even for sewing novices. These bright yellow café curtains seen on Architecture Art Design totally transform this little reading nook into the perfect sunny Sunday spot. Tired of boring blackout curtains? These intricate cutout curtains from Colossal will warm do just the trick. Design hole punch to create your own striking patterns, but know that this look is a bit harder for a novice to DIY. Another dyed option, these dipped curtains from Homepolish are even easier than Shibori. Once the dip dyeing starts, all of the textiles in your home will be itching for a reboot. This is a great idea for renters or anyone who doesn't want to drill holes in their walls for a curtain tieback. Gather your curtains up with festive pom poms using this easy tutorial from The Weaving Loom. Pick yarn colors that complement your curtains, and this look can be achieved for under $5. Change up a look simply by pulling the curtains in opposite directions to give the room more texture and drama, as seen in this look shared by Rose Mitschke. This works best with sheer panels or solid linen curtains, as patterned pieces may look cluttered and overwhelming. Go bold with this painted idea. Great for a nursery or a kids' room, these bold black polka dot curtains from Nalle's House will immediately grab attention (in a good way). Don't worry about consistency; large patterns like this are easier to maintain throughout the piece.